To make matters worse, when alcohol or drugs are first used at an early age, the risk of developing an addiction greatly increases.1 The desire to fit into a social group can also lead to increased pressure to drink or use drugs. 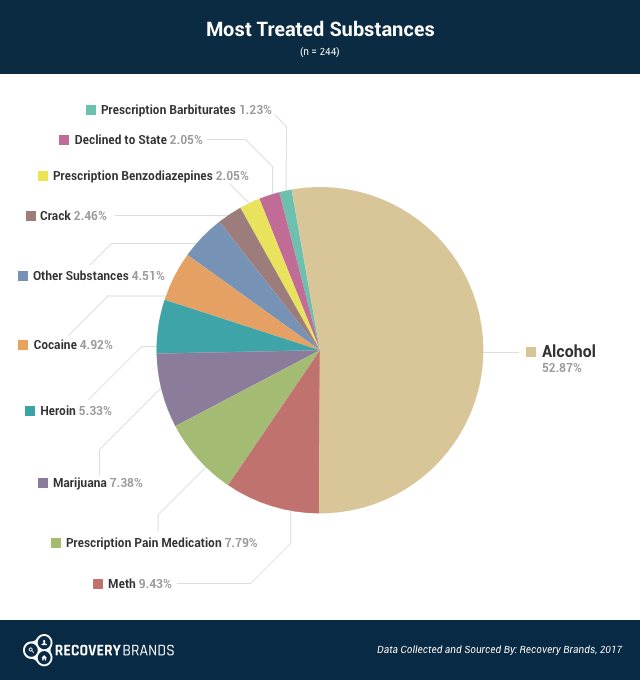 Ethanol (alcohol) is abused more than any other drug among those engaged in treatment, as a 2017 survey by Recovery Brands revealed. Out of all the survey responses, nearly 70% of people went to treatment because of an alcohol problem, and a surprising 52.87% of respondents sought the most treatment for alcohol abuse. Despite the wide variety of abused substances individuals seek treatment for, ethanol seems to cause the most widespread damage. Fortunately, help is widely available. While alcohol use rates are decreasing for American teens and young adults, many high school students still engage in alcohol abuse—in fact, they misuse alcohol more than any other substance.3 Many young people have access to alcohol in their homes, or can convince someone to purchase it for them, making it the most readily available and easily obtained of all the abused substances. Fact: Many people believe marijuana is not addictive or harmful because it is a natural plant substance. This is faulty logic—cocaine is made from the coca plant and heroin comes from the poppy plant, and few people will dispute that these drugs are extremely addictive. Where a drug comes from often has little bearing on how addictive it can be. Heavy marijuana use can lead to physiological dependence and cause extensive damage and distress in your life. Myth: You can’t get addicted the first time you try drugs. Fact: Every person’s physiology is different. Therefore, you cannot predict how any drug will affect you, especially the first time you try it. Certain substances are considered to be extremely addictive and can quickly lead to an addiction. The euphoria of the high can lead to intense urges to continue using the substance, even after one time. Myth: I’m too young to get addicted to alcohol or drugs. Fact: Addiction does not discriminate when it comes to age. Anyone who drinks or uses drugs runs the risk of becoming addicted. In fact, people who drink alcohol or use drugs at an early age are much more likely to develop an alcohol or substance use disorder. Myth: It is easy to simply stop drinking or using drugs. Fact: For many, addiction is a chronic medical condition, rather than an issue of willpower. Once an alcohol use or substance use disorder has taken hold, it is much harder to stop drinking or using that substance. Addictions create changes in your brain, making it very difficult to stop using without the guidance and support of addictions professionals. Participating in formal treatment and self-help groups is vital to the recovery process. Myth: You can cure an addiction by taking medication. Fact: This is false. Addiction is a chronic process that is not easily cured, but rather is managed over time, similar to diabetes or asthma. This is not to say that medications aren’t important tools used in the management of various forms of substance dependence. For instance, the withdrawal symptoms experienced by a person addicted to drugs can be reduced through the medically supervised use of certain prescription medications; there are even medications that can reduce the frequency and intensity of cravings. Substance use disorders are managed through a combination of detoxification, counseling, education, and abstinence. Myth: People only hurt themselves when they take drugs or drink alcohol. Fact: When teens misuse drugs or alcohol, other people are dramatically affected. A teenager who misuses a substance or has an addiction to drugs and alcohol is far more likely to be involved in an accident or commit a crime.1 Additionally, people under the influence often say and do things they normally would not do while sober, due to reduced inhibition and judgment. Stripping away inhibitions often leads them to hurt their friends, family members, and coworkers. Family members and other loved ones often experience excessive stress due to worrying about the addicted individual and dealing with the consequences of their actions. Myth: Prescription drugs are not dangerous if prescribed by a health care professional. Fact: Prescription drugs can be safe, but only if they are taken as prescribed. Drugs consumed in a manner not indicated by the prescription can be dangerous and lead to drug dependency or the development of serious health complications. Always follow your doctor’s directions when treating a medical condition with prescription drugs. Do not take more than the prescribed dose, take pills more frequently, for longer than prescribed, or by a different means than prescribed, such as crushing, snorting or chewing the pills. Myth: Drinking or using drugs won’t have any harmful effects on young people. Finding help for a teenager or young adult with an addiction can be a scary and overwhelming process. If you know a teenager who wants to get help for an alcohol or substance use disorder, call our 24-hour helpline at 1-888-287-0471	Who Answers? for assistance with finding a treatment center. Let us help guide you to the help your teenager needs. National Center for Children in Poverty. (2011). Adolescent substance use in the U.S.
U.S. Department of Health and Human Services. (2016). Substance abuse. Centers for Disease Control and Prevention. (2015). Trends in the prevalence of marijuana, cocaine, and other illegal drug use. National Institute on Drug Abuse. (2015). Drug use trends remain stable or decline among teens. Centers for Disease Control and Prevention. (2015). Trends in the prevalence of alcohol use.